Bronson Canyon should have its own IMDB page. The area’s Bronson Caves (an old quarry mined in 1903) became eye candy to nearby Paramount Studios and was the "cave of choice" for both Western and Sci-Fi Movies (i.e., The Three Musketeers, The Lone Ranger Rides Again, Invasion of the Body Snatchers, and The Return of Dracula to name but a paltry few). Robert Towne’s Chinatown was also filmed, in part, in Bronson Canyon. In fact, Charles Bronson took his stage name from Bronson Gate at Paramount. The area has a wonderful collection of Craftsman Bungalows, Colonial and Spanish Colonial Revivals as well as Tudor Revival architecture and is almost completely residential. 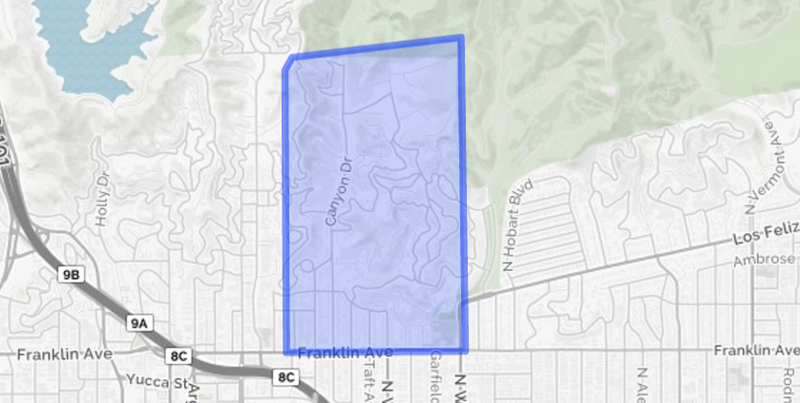 The lower part of Bronson Canyon is included in the Hollywood Grove Historic Preservation Zone designated by the City of Los Angeles in 2011. The neighborhood lies beneath famous Griffith Park. Another historically significant neighborhood, Bronson Canyon, like its more famous neighbor, Laurel Canyon, offers residents the ability to sightsee right from their front yard, an opportunity not afforded anywhere else in the world. Location: North of Franklin Avenue, from Bronson Avenue to Beachwood Drive on the West. Falling in love with Bronson Canyon?